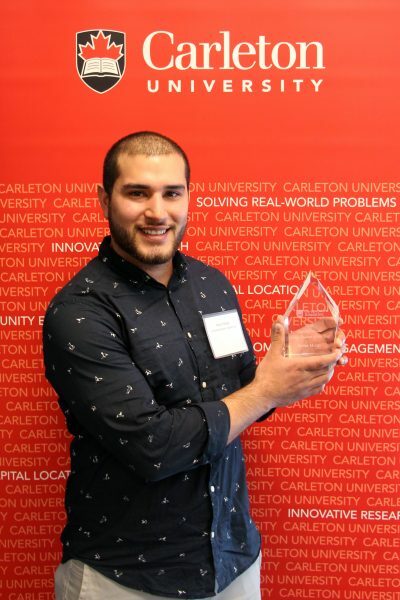 Carleton University’s Co-operative Education Office holds the Co-op Awards each year to recognize the achievements and outstanding contributions and performance of our co-op students and their employers. All nominees were invited to a reception, where the winners of the Co-op Student and Co-op Employer of the Year Awards were announced. This year’s reception took place on Friday, March 24. Click an award name below to read about this year’s winner! 2016 Co-op Champion, Taryn Laurendeau, posing with her award certificate at the 2016 Co-op Awards ceremony and reception on Friday, March 24, 2017. 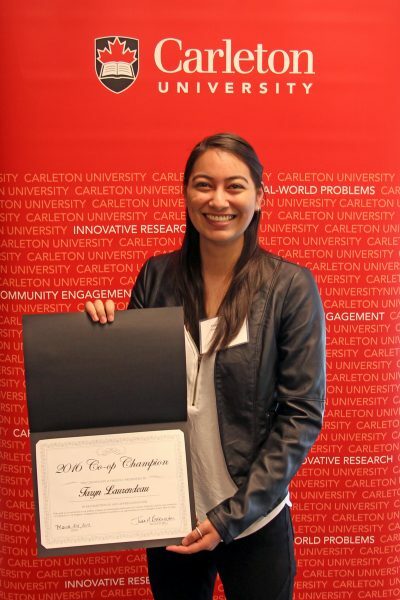 The 2016 Co-op Awards included the inaugural presentation of the Co-op Champion Award to Taryn Laurendeau, a fourth-year Bachelor of Information Technology student in the Interactive and Multimedia Design (IMD) program. Her exceptional work and promotion of Carleton’s Co-op Program is unprecedented and Co-operative Education staff decided Laurendeau’s efforts needed to be recognized. Laurendeau self-developed a co-op position as a Junior Pipeline Developer at the Montreal office of MPC Film, a global visual effects studio. While she was working in Montreal, Laurendeau facilitated meetings between leadership at MPC and the Co-op Office to strengthen their working relationship and attempt to make hiring from Carleton’s IMD program a regular occurrence. While on the job at MPC, Laurendeau was headhunted by another studio. Although she was unable to accept the position, having already completed all of her required co-op work terms, she did not let their offer become a lost opportunity, and instead put the studio in touch with the Co-op Office so that they may try to fill the role with another Carleton co-op student. Paying forward the helping hand co-op has had on her career development, Laurendeau took it upon herself to approach an MPC colleague, the lead of another team, and assisted in developing a scripting/coding co-op position for a second-year Carleton IMD student. To thank Laurendeau for her exemplary behaviour, the Co-op Office created the Co-op Champion Award. This award was presented in recognition of and appreciation for Laurendeau’s exceptional work as a co-op student, acting as an outstanding ambassador for Carleton University and co-operative education, and for her constant promotion of Carleton’s Co-op Program, which resulted in the creation of excellent co-op opportunities for her colleagues in their field of study. 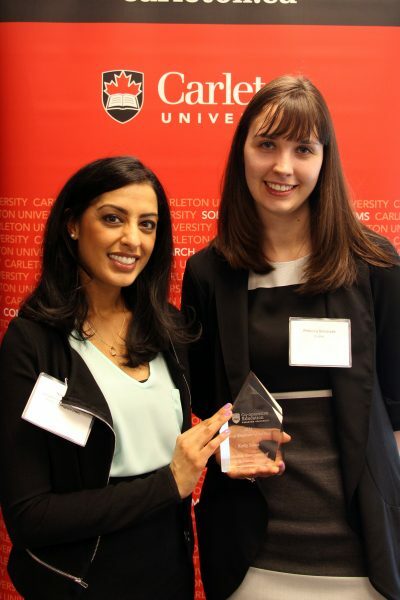 From left: Kelly Stone’s colleague, Nina Suagh, accepting the 2016 Co-op Employer of the Year award on her behalf, with Rebecca Balcerzak, the co-op student who nominated Stone for the award. Kelly Stone, Executive Director of the Canadian Association of Family Resource Programs (FRP Canada) won the 2016 Co-op Employer of the Year Award. This is the second year in a row Rebecca Balcerzak, a fourth-year English student, nominated Stone for Co-op Employer of the Year. “It is my extreme privilege to be under the mentorship of my Executive Director, Kelly Stone. A kind, generous and approachable individual, Kelly is a role model for every young professional that walks though her door,” said Balcerzak in her nomination form. It is clear Balcerzak’s two co-op work terms with FRP have been significant for both student and employer, as Stone and Balcerzak nominated each other for the 2015 Co-op Employer and Student of the Year Awards respectively, and both received honourable mentions at last year’s awards ceremony. 2016 Undergraduate Co-op Student of the Year, Stefan Murga, with his award at the 2016 Co-op Awards ceremony. Congratulations to Stefan Murga, a third-year computer systems engineering student and winner of the 2016 Undergraduate Co-op Student of the Year Award. Murga was nominated for his impressive work and project management performance throughout his eight-month co-op work term at Stantec Consulting Ltd. by supervisor, Peter Dyck, Principal, Power Systems Engineer. One of his most significant work term accomplishments was updating and converting a number of custom Microsoft Access databases that were not originally well written and had consequential limitations. “We could not provide Stefan with much spare time to do this work and did not have high expectations for what he would be able to complete, but in the end he did it less time than expected, without impacting his productivity on other projects, and the efficiency gains from the new software usage will save the company a considerable amount of money annually,” said Dyck, whose nomination letter of support was overflowing with kind words and praise for Murga’s work. Christian Holloway, 2016 Graduate Co-op Student of the Year, with his award at the 2016 Co-op Awards reception on Friday, March 24, 2017. 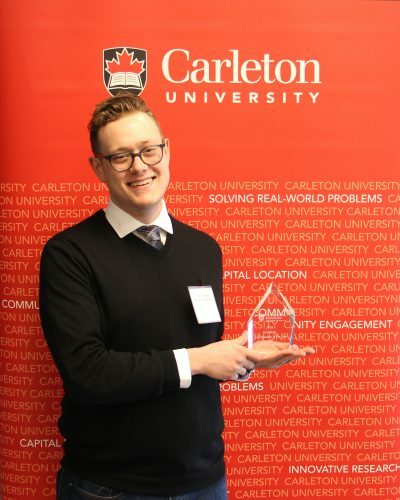 Christian Holloway, a Master of Public Policy and Administration student, is the recipient of the 2016 Graduate Co-op Student of the Year Award. Holloway completed two consecutive work terms as a member of the Policy and Negotiations team of Climate Change International at Environment and Climate Change Canada (ECCC). Holloway was nominated by Catherine Stewart, Director General of Climate Change International at ECCC for delivering a quality of work that far exceeded that expected or previously seen in such a role. “He has demonstrated that he is able to handle complex tasks with competing priorities and deliver high quality work that deserves mention—most notably, Christian developed and drafted a submission on behalf of Canada. His document was posted on the United Nations Framework Convention on Climate Change website and was cited in a report done by Ms. Laurence Tubiana, French Ambassador for climate change,” said Stewart in her letter of support. 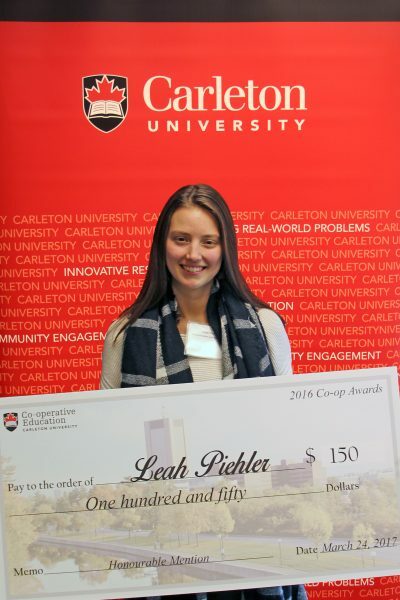 Leah Piehler, honourable mention for the 2016 Undergraduate Co-op Student of the Year Award, posing with her novelty cheque at the Co-op Awards reception. Fourth-year Bachelor of Communication and Media Studies student Leah Piehler, and Matthew Jonah, who is completing his Master’s degree in Public Policy and Administration, both received honourable mention for their work ethic, positive attitude, and meaningful contributions to their project outcomes throughout their respective co-op work terms. Graduate students are required to complete two four-month work terms in order to earn the co-op designation towards their degree. Jonah completed his first of two work terms at the Automotive and Transportation Industries Branch at Innovation, Science and Economic Development Canada (ISED) throughout summer 2016. Jonah was hired part-time in January 2017 to continue his work with ISED. Leah Piehler received a glowing nomination from her supervisor, Stéphanie Ducharme, Manager of New Service Offerings at the Transformation and Integrated Service Management Branch of Service Canada. “Leah is not only the very best co-op student I have had on any of my teams, but she is bar-none one of the most hardworking individuals I have met,” said Ducharme in her nomination form. Congratulations to all Co-op Awards winners, honourable mentions, and nominees!